In this system, a special type of the user model is supported called as a task model. It is aimed at supporting information analysts who are required to solve a specific task. A very short term user model is constructed to model each different user task and personalization is made with the task models. A post filtering approach was applied to this purpose. 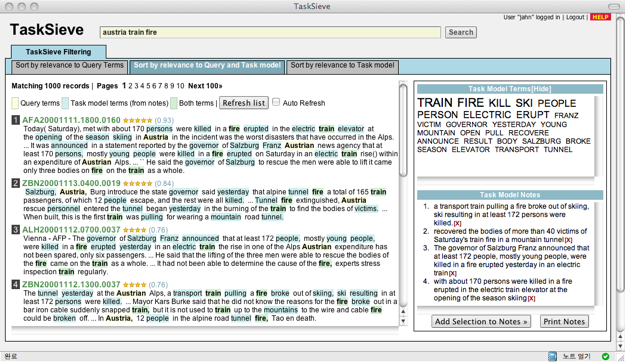 The ad-hoc retrieval results triggered by user queries were re-ordered using the task model so that more relevant documents to the task model should be ranked up in the lists. In terms of the interface, we added a control with which users can control the effects of the query and the task model according to their needs and the context. J.-W. Ahn, P. Brusilovsky, D. He, J. Grady, and Q. Li, "Personalized web exploration with task models," in WWW '08: Proceeding of the 17th international conference on World Wide Web. New York, NY, USA: ACM, 2008, pp. 1-10.